As our Wild Card Finalist Blake Sebalo is literally one in a million, having been selected randomly from amongst ALL entries sent through for the My Top Billing Dream Home competition. Blake has been a fan of Top Billing since the very beginning, with Top Billing homes and travel being his favourite features. Blake is a family man hailing from Glenvista in Johannesburg where he works as a temp selling paraffin in informal settlements. His dream is to start his own business and provide his children with the best that life has to offer. 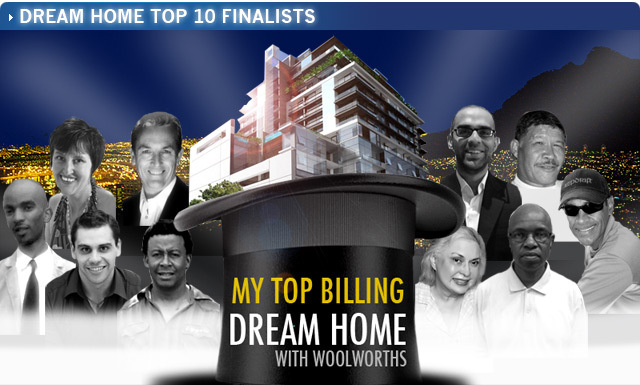 By winning the Top Billing Dream Home he believes he could make all of his dreams come true! At 70 years old Constance is the oldest finalist in the Top 10, but you can never be too old to dream or to win. Constance has been watching Top Billing for the full 21 years. Having been an avid traveller herself, she looks forward to the show’s travel segments each week. Constance is a full-time doting granny and nanny to her beautiful granddaughter. She wishes nothing but the best for her only grandchild and says that should she win the apartment she would keep it for her granddaughter to eventually inherit. Since the very first broadcast of Top Billing, Robin van Graan was hooked. Even today, he still considers himself an ardent viewer and a loyal fan of the show. He finds inspiration in every aspect of the show: homes and décor, travel, special events and of course success stories from all around South Africa. Robin believes that his humility and attitude towards life will determine his success and destiny, he lives by his motto “to reach for the starts & keep my feet firm on the ground”. Robin says that he has always aspired to owning a Top Billing designer home and the Dream Home competition may provide an opportunity for him to make his dreams a reality. Originally from P.E. Mohamed has been living in Johannesburg since 2004. An Internal Auditor for a shipping company by day, Mohamed also works with a number of NGOs and charities in his spare time. He also enjoys running, reading and working with up and coming artists on charity projects. He and his wife plan their Thursday-night dinners around Top Billing and watch every week. Mohamed believes that it is serendipitous that he made the Top 10 of the My Top Billing Dream Home with Woolworths competition just as he was planning to move to Cape Town. The young couple’s search for a place to live could soon be over if Mohamed wins the Dream Home and he looks forward to a fairy-tale beginning to a new life for him and his wife in the Mother City. Spencer, an anaethists from Cape Town, has been an avid watcher of Top Billing for the past 20 years. Spencer lives in Kenilworth with his wife and three teenage children. The lifestyle inserts together with the exotic travel detinations have always been a favourite for Spencer and his family. Having had the priviledge of renovating many homes, Spencer has been able to identify with the My Top Billing Dream Home competition with Woolworths. Winning the Dream Home would have an incredible impact on Spencer’s life. Working long hours, Spencer believes that if he was to win the Dream Home, he would then be able to devote more time to deserving volunteer medical causes. Having raised four children Rodney Williams is enjoying a well-deserved retirement. Rodney was born and raised on the greater Johannesburg area and has been watching Top Billing since the show first broadcast in 1992. Rodney is planning to stay in Johannesburg and take care of his mother and winning the Top Billing Dream Home would bring in the necessary additional income to make sure she is well taken care of. Simlindele was born, bred and schooled in Mthatha in the Eastern Cape. Currently he lives in Summer Greens, in Cape Town and has a 3 year old daughter named Mbali. Simlindele works as a consultant in digital banking but is also an aspiring academic, studying further to give himself and his daughter a better life. He has been watching Top Billing since he was in the seventh grade and has grown up loving the show’s travel and fashion. Simlindele says that if he won the Top Billing Dream Home he would know that his and his daughter’s financial future was secure and he would be able to complete his studies without pressure. The impeccable green star rating of the Top Billing Dream home is especially enticing to Zwelakhe, as he has always enjoyed the homes featured on Top Billing especially those homes which are eco-friendly and green. He currently lives in Pretoria with his two boys: 12 year old Mincili and 7 year old Cwangco. He enjoys soccer and Formula 1 racing and is a keen photography enthusiast. Zwelakhe saves a special spot each week to watch Top Billing and aspires to one day own a home for him and his children that is both beautiful and eco-friendly. The My Top Billing Dream Home with Woolworths competition might be Zwelakhe’s opportunity to do exactly that.